This post was first published in TH!NK ABOUT IT site 25th February 2009. Parliament is a venerable name of democratic institution, one could even suppose that its members are doing some worthy job and decisions there. However a couple of examples from last week again showed where the real power is. The meeting in the German capital on Sunday, Feb. 22, was designed to forge a common EU response to the global financial crisis ahead of a G20 summit in London on April 2. The talks, called by Germany’s Chancellor Angela Merkel, were attended by the leaders of France, Britain, Spain, Italy, the Netherlands, Luxembourg and the Czech Republic, the holder of the rotating EU presidency. If the inner circle decided about response to the financial crisis the second circle – EU’s 27 FMs – was also working with significant topic. On 28 January, the European Commission proposed to reallocate five billion euro of unspent EU money, mostly to support clean coal projects, offshore wind farms and the deployment of broadband Internet connections in rural areas. 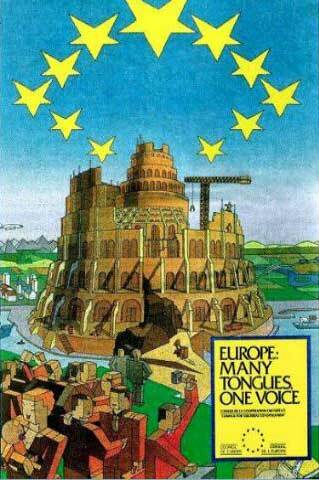 However the blocks foreign ministers failed to agree on this European Commission proposal. The reason was unequal distribution of projects. Probably new deal will be made with more equal base and forgetting the common needs and quality planning of projects. Forgetting EU’s organogram as illusion and speaking reality one can easily find different decision making practices in EU depending about importance of issue. Most important core group is cooperation between France and Germany sometimes adding UK to group. Feb. 22 meeting was example about ad hock planning body while FMs meeting Feb 23 represents the regular decision making. Commission of course has great de facto power not only on implementation level but also designing proposals handled in EUs inner cores; the same can be said about bureaucrats in national ministries who are designing policies decided EU meetings at summit/ministry levels. There is amazing similarity in decision making between EU and ex-Soviet Union. USSR had also some “democratic” institutions like parliament and government, but the real power was in party machine and its “politburo”. So where is this leaving European Parliament? It may handle some energy bulb level issues but honestly the whole institution seems to be unnecessary creation only to keep some democratic illusion on show. As EU citizens are not so stupid to keep his institution more than a puppet theatre they show their attitude by low turnout percentage. EP is practical place to locate some second class politicians for retirement or out to not make any mess in national policy. They also can show good places to get fresh mussels while voters are visiting in EP as their quests. Designing EU policy happens anyway somewhere else. More my views in my Archives:Blog! This post was first published in TH!NK ABOUT IT site 21st February 2009. An Italian non-governmental organisation – the Rome-based “Un ponte per …” – is investigating consequences of NATO’s 1999 bombings of Serbia and the effects of the use of depleted uranium (DU) on the civilian population. The NATO allegedly used shells with depleted uranium which are still today causing an increase in the number of cancer patients. NATO has admitted the use of DU in the bombing campaign and Italian media has reported that 45 Italian soldiers who served in the international forces in Kosovo (KFOR) died after the bombing and 515 became ill with cancer. In Serbia and its separatist province Kosovo the number of civilian victims is still unexplored but most likely the figures are manifold compared to those of soldiers. This topic was discussed years ago when e.g. I was working in Kosovo, however any proof and warnings then did not came to my hands. Later more information was available and on 24th Nov. 2008 I wrote an article “Depleted Uranium from NATO bombs killing people in Balkans” referring information I got from Croatian news portal Javno. To get picture above larger go to link . Over the 78 days of NATO bombing, a total of 31,000 shells with depleted uranium, weapons banned by international treaties, were dropped in at least 112 locations in Serbia and especially Kosovo region. Earlier in Bosnia-Herzegovina around 10,000 rounds were fired in operations around Sarajevo in the latter stages of allied operations in Bosnia. More than 100,000 DU shells were fired during the Gulf war 1991. Un Ponte per… (UPP) is a volunteer association established in 1991 just after the end of the bombings on Iraq. Its aim was to promote humanitarian aid to the Iraqi population. When the war in the Balkans escalated, the association created new campaign and started various projects aimed at sending medicines and health supplies to the Yugoslav Federation and helping refugees from Kosovo. UPP’s institutional partners include ECHO, UNHCR, UNICEF, UNESCO,UNOPS,UNHOCI ,UNRWA, Italian Municipalities and Regions and Provinces, and more info about their activities can be found from their web-site . The ‘Un ponte per…’ investigators will tour several Serbian cities that were hardest hit during the bombings before submitting a report to the Rome-based NGO. The British and US governments have long denied that DU ammunition is harmful. The British Gulf Veterans and Families Association have for years called for systematic testing. 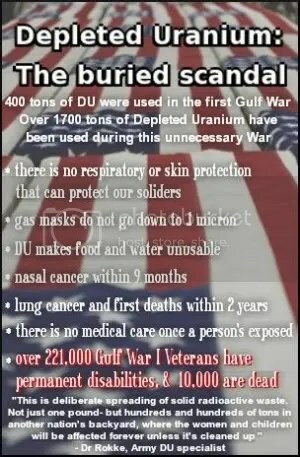 It claims that “hundreds” of Gulf warriors have died of cancers and other illnesses contracted during active service. Also WHO is quite cautious about health risks of DU (More in WHO factsheets ). There is huge contradiction between official position of DU users and findings on the ground. The situation is a bit similar like position of tobacco industry compared the one of smokers – many have been died but direct evidence of causality is missing. There is a developing scientific debate and concern expressed regarding the impact of the use of DU projectiles and it is possible that, in future, there will be a consensus view in international legal circles that use of such projectiles violate general principles of the law applicable to use of weapons in armed conflict. No such consensus exists at present. In United Nations in December 2008, 141 states supported a resolution requesting that three UN agencies: United Nations Environment Programme (UNEP), WHO and IAEA update their research on the impact of uranium munitions by late 2010. From the other side there is also growing movement to ban DU military use. International Coalition to Ban Uranium Weapons (ICBUW) – is now comprising over 102 member organisations in 27 countries. From their web-site one can check latest developments. If the causality between DU military use and morbidity will came clear one could speak war crime and demand some responsibility from those who have decided to them. This could also be one connecting factor in Balkans because DU maybe is killing people – civilians and soldiers – there regardless of their ethnicity, religion and country as well foreigners in mission. We are witnesses of the transformation of the state into the private property of the leadership that wants to monopolize everything good that we inherited, our entire history and future, and which has transformed Government into organized corruption. Rude words but given the background also understandable. Today’s PM Thaci and Haradinaj are representing two leading and competing tribes or clans of organized crime in Kosovo. Both have been accused also e.g. about war crimes, Haradinaj even was in Haague but released when witnesses surprisingly were murdered or threaded to keep their mouth shut. State as private property is quite good description about how matters stand. 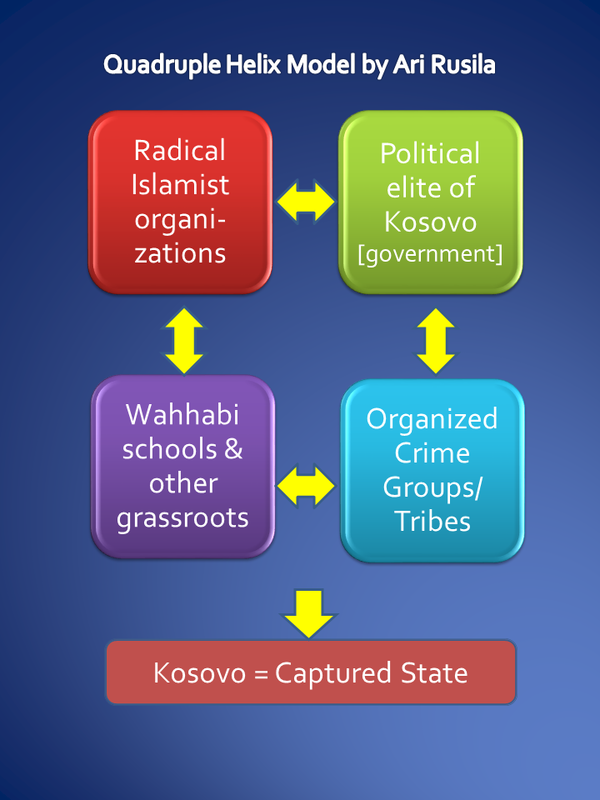 I have earlier described circumstances in Kosovo with “Quadruple Helix Model” where government, underworld, Wahhabbi schools and international terrorism have win-win symbiosis. First I was thinking that Kosovo is sliding to be a “failed state” now I am tending to the opinion that a “captured state” is better definition – maybe Kosovo’s ex-PM is concluding the same. From the other side celebrations went without incidents so as positive point one could conclude that conflict has rised on the level of words which is real progress compared region’s past. You are currently browsing the Conflicts by Ari Rusila blog archives for February, 2009.